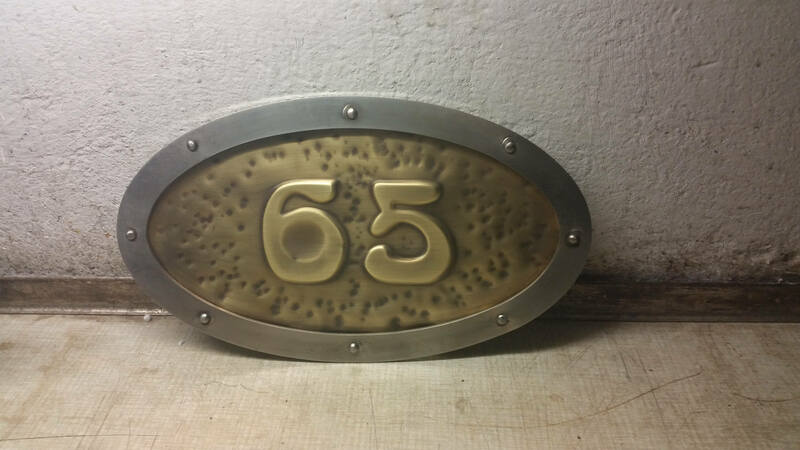 Handmade brass house sign. OVAL SHAPE. Medium size. Embossed brass plate, in a solid steel frame with hand forged steel rivets. Steel frame is thick 3 mm. Brass we use is 0.6mm thick ( 0.02inch) - it is very strong and durable, the same as for roof use. Both frame and brass are patinated , waxed and oiled in a traditional craft style, we do not use laquier that will crack over time. This sign will fit up to 5 numbers, you have a choice of 4 different fonts as on the pictures above.